When Peter Beardsley left Newcastle in 1987, Tyneside needed a new hero. Mirandinha – or Little Miranda, as Newcastle fans know him – answered the call. Just under £600,000 saw him become the Premier League’s first Brazilian in history and, with an impressive scoring rate in the Brasileirão behind him, St James’ Park sizzled with anticipation. Colour, glamour and goals awaited. Two years later, they were still waiting. Mirandinha, despite scoring against Manchester United and Liverpool, was shipped back to Brazil. Newcastle’s brief flirtation with Samba football was over, coal-stained hands burned badly over the gormless pursuit of flair. The Premier League, with its sodden pitches and grimly Neolithic defences, was no place for the frolic and whimsy of Ipanema. In 1992, an arrogant Frenchman challenged the orthodoxy. After signing for Manchester United, Eric Cantona set a new technical benchmark, proving in his scandalous displays that even something as frivolous as talent could thrive in the muck and bullets of the Premier League outback. For neither the first nor the last time, the nation followed the Manchester trend. 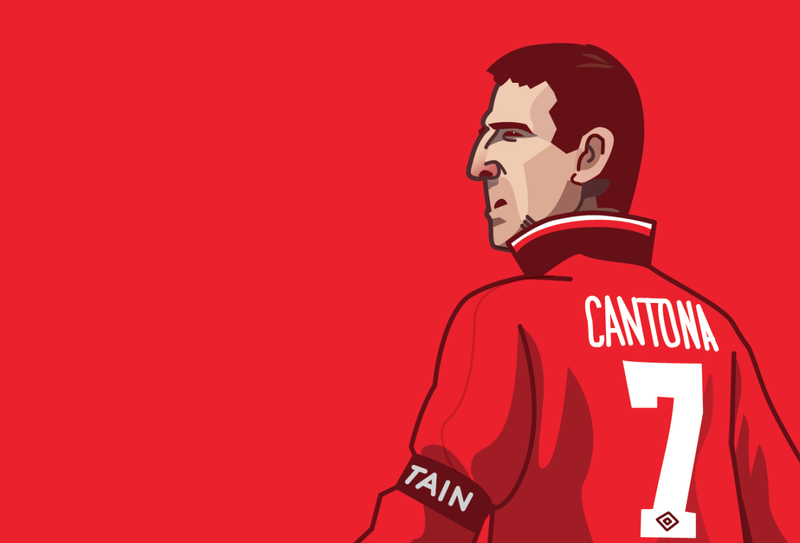 Clubs throughout the newly-formed Premier League sought their own Cantona, with varying degrees of success. Dennis Bergkamp spoke for himself; Paulo Futre less so. It was in a town in the north-east of England, though, where one of the most celebrated players in Premier League history took his first steps. To the uninitiated, Middlesbrough is a kaleidoscope of smoking chimneys, ashen-faced locals and nuclear-grey clouds. To the ‘Smoggies’ who call it home, however, it is the birthplace of Captain Cook and where the steel of Sydney’s Harbour Bridge was forged. By 1995, it had a football team worthy of its defiant, industrial history. Bryan Robson didn’t have anything left to prove when he joined the club as player-manager in May 1994. Aided by the goals of Uwe Fuchs, he led the club back into the Premiership at the first time of asking. With the crumbling Ayresome Park closing its doors, the Cellnet Stadium was a gleaming promise of modernity. It was the summer signings, however, that had most supporters in a frenzy. Backed by the cash and goodwill of chairman Steve Gibson, Robson and his chief executive Keith Lamb secured a number of high-profile captures, including a young Nicky Barmby. It was the signature of Brazil’s number 10, though, that made international headlines. Two decades before that summer, Osvaldo Giroldo Júnior was born in a middle-class suburb of São Paulo. At first glance, his story is recognisable: a talented kid who played in the streets every day, looking to emulate the skill of his idol, Zico. His was a preternatural gift; everybody in his neighbourhood thought a career at the highest level was to be expected, not hoped for. At just five foot five inches, however, a succession of coaches saw too little in his frail, hollow-cheeked ability. Clube Atlético Juventus were the first to turn him away, before another rejection by Corinthians when he was 13 had him doubting a career in the game altogether. Despite his diminutive frame, ‘Little Junior’ displayed the kind of grit for which he would later be renowned. Buoyed by the support of his family, he relocated to Itu, joining the youth team of the local club Ituano FC. Over the next two years, he progressed from the reserves to the substitutes bench, before finally making his debut in the São Paulo State Championship in 1992. The following year, he was an ever-present in the starting line-up, scoring 10 goals as some of Brazil’s biggest clubs started to take notice. Finally, Juninho had arrived. São Paulo were the first to pounce, with Telê Santana impressed by a display in which Juninho had shocked the Morumbi to score and assist off the bench in a 3-3 draw. For all his talent, however, the Tricolor’s new toy faced daunting competition. Santana had just led his side to the Copa Libertadores, as well as beating Johan Cruyff’s Barcelona in the Intercontinental Cup. With the unchecked class of Raí and Müller and the exuberance of a young Cafu on the wing, it was one of the most impressive teams in Brazilian history, with a string of the first team turning out regularly for the Seleção. Barely a year after signing, Juninho was immovable from the team. Deployed in the hole behind the main strikers, his performances saw him voted Brazil’s Young Player of the Year. ‘Chucky’ – as he was christened by teammates for his likeness to the demonic doll – was a frightening talent with the world at his feet. By then, he had already been appointed as Brazi’s new playmaker, the leading actor of a youthful generation that had received the baton from 1994’s ageing conquerors. When the national team arrived in London for the Umbro Cup a year after that triumph, Juninho was the doyen in a team of hubristic princes. Edmundo, Ronaldo and Roberto Carlos were his devastating kinsmen. On 11 June 1995, Juninho played the game that sealed his future. Evading the violent attentions of David Batty, he scored a marvellous free-kick before setting Ronaldo up for a second seven minutes later. Bryan Robson, despite his hangdog expression on the England bench, knew he had to have him. Flying to Brazil a few months later, the Middlesbrough delegation set about convincing São Paulo to forego the jewel in their crown. At the time, Juninho was renegotiating his contract with the Tricolor, with Internazionale monitoring the situation closely. When Middlesbrough’s interest was put to him, he was unsure. English football seemed ill-suited to his talents, a gauntlet of flying bodies and mud-strewn pitches. Middlesbrough itself was an unknown entity, but Robson was a man who couldn’t be ignored. Convinced by the club’s ambition and vision, he took a risk. The next day, a private jet landed at Teesside Airport to a swathe of Brazilian flags and banners. A crowd of Boro fans waited at the exit, hoping to catch a glimpse of the man who’d put their club on the map. Several thousand more waited at the stadium, where a startled Juninho emerged in a suit that looked two sizes too big. Fans hung over the tunnel entrance waving scarves and hoping to shake his hand, with the polite, slightly-uncomfortable new signing giving autographs and smiling dolefully at the cacophonous chants of his name. The press conference was similarly electric, with Robson announcing the arrival amidst a maelstrom of garish flashbulbs and whirring cameras. Juninho, he said, would be a vital addition to the team’s plans for an attacking passing game. On the pitch, it didn’t take long for the anticipation to congeal into reverence. In a game that was broadcast live on Brazilian TV, Juninho took just 11 minutes of his debut to register his first assist, spooling a delightful through ball past the Leeds defence for Jan Åge Fjørtoft to finish handsomely. Off the field, however, the adaptation was slower It was only when Juninho’s family followed him to Teesside that he began to settle, with the translator provided by the club proving unfit for the task. As Boro fans quickly established, there was more to their new signing than his myriad skills. Despite his miniature build, Juninho was uncompromising in the tackle and surprisingly robust, having honed his skills in the notoriously physical Brasileirão. ‘The Little Fella’ as he was soon christened might have been a delightful playmaker, but he was just as nimble in the darker arts, adding his own measure of boots and shoulders to the league’s brutal tapestry. The build of David, the brawn of Goliath, and the inspiration as Boro went on the secure an unlikely 12th place finish. If the previous summer was momentous, the following year was earth-shattering. Robson’s dalliance with Brazilian talent had paid off, with Juninho’s performances helping the club to fourth place in October before their form tailed off. Encouraged by Juninho’s adaptation, Robson had signed off on another exotic talent in the summer, with Emerson’s luxurious dreadlocks shockingly out of place in a town more acquainted with a short back and sides. Fabrizio Ravanelli, meanwhile, was a salt-and-pepper predator with a proven goalscoring record. With another talented Italian in the form of centre-back Gianluca Festa, Middlesbrough were primed for an assault on the European places. It made their subsequent relegation all the harder to swallow, with Boro’s paper-thin squad exposed. Unable to field 11 players in a game against Blackburn in December, the club were docked three points, a decision that proved fatal to their Premier League status. Despite scoring more goals than everyone outside the top seven, they were down. As relegation was confirmed on the last day against Leeds, Juninho sat disconsolate on the Elland Road Turf. He knew that, with the 1998 World Cup in France just a year away, a move from his “second home” was unavoidable. Middlesbrough fans, to their credit, saw what Juninho had given them. Despite dropping from the top flight, the Brazilian had been one of the best players in the league, helping his teammates to appearances in both the FA Cup and League Cup finals. In games against Chelsea and Leicester, he had been given special attention, with challenges from Frank Lebeouf and Roberto Di Matteo giving a bitter taste to their eventual triumph. Against Martin O’Neill’s side, meanwhile, Juninho had been brutally nixed by Pontus Kåmark, the speedy Swede who was given only one job. Boro were a victim of their own ambition, as confirmed by Robson years later when he admitted to the Gazzette that “the cups got us relegated”. His best player, however, wouldn’t be joining the fightback in the First Divison. By the time Roy Evans lodged late interest from Liverpool, Juninho had already signed for Atlético Madrid. “Get rid of the poofters.” That was the advice of the infamous Jesús Gil to his new coach at Atlético in 1995, Radomir Antić. A domestic double in his first season had quietened the domineering Spaniard somewhat, but the Serb was under pressure following a fifth-place finish the following year. As the 1997/98 season beckoned, £25 million for Juninho and a young Christian Vieri seemed like a prudent exercise in self-preservation. Vieri did what he always does, scoring 24 goals in as many games, but Juninho’s stellar 18 months would be ended in the most brutal of fashions. Through on goal in a league game against Celta Vigo, his ankle was shattered by the retreating Michel Salgado Despite making a late return to fitness towards the end of the season, Mário Zagallo left him out of the World Cup squad. His dream was over. Things weren’t much better at club level, either. After finishing in seventh, Antić was sacked. His successor, Arrigo Sacchi, didn’t last long either – just under a year, in fact, before the Serb was recalled to salvage a shambolic end to the 1998/99 campaign. Juninho arrived at the Estádio São Januário to realise that his identity had been stolen. Vasco had their own playmaker by the same name, two years younger but no less talented, a deadly free-kick taker with an altogether more surly expression. Juninho Pernambucano shunted over to make room for the latest recruit, who henceforth would be known as Juninho Paulista, with both differentiated according to the state in which they were born. Together, the pair made Romário’s job easy, with O Baixinha’s goals firing his side to the João Havelange Cup in 2000. A year later, Juninho put in what many commentators consider one of his finest ever performances, grabbing a hat-trick and three assists during a 7-0 shellacking of Botafogo. Alas, his time at The Hill would be short-lived. A disagreement over unpaid wages saw him make the short journey to Gavéa in January 2002, where he joined Flamengo alongside AC Milan legend Leonardo. Given the shirt number of his idol, he was expected to deliver the kind of performances that had made Zico such a halcyon figure at the Mengão. Juninho, however, didn’t need any extra motivation. With the pain of his exclusion in 1998 still lingering, he set his sights on a place in the 2002 World Cup squad. Flamengo’s fans offered their assistance, blessing him with leaves from the local Espada de São Lorge plant. The intent was to ward off any negativity from his days with their Rio rivals, but while it might have worked for Juninho personally, the team was diabolical, finishing 18th despite the goals of the in-form Liédson. With president Edmundo dos Santos Silva deposed over alleged tax evasion offences, the club was a shambles. If Flamengo were flailing, however, the national team were in even greater peril. Brazil had only just managed to qualify for the World Cup, finishing third behind Ecuador as they stumbled under Luiz Felipe Scolari’s uncertain management. Juninho had been called up the squad but was an unlikely starter in what many Brazilians regarded as one of their worst World Cup teams in history. When Emerson was injured in a freak accident just before the tournament, the mood in the country darkened further. Juninho profited from the Roma man’s misfortune, trusted in a deeper role alongside Gilberto Silva. He appeared in all three group games, but was substituted in each fixture after seeming stifled by his defensive shackles. With his place in the team usurped by Kléberson, his only further appearance came in the final after the game against Germany had already been won. With a World Cup winners medal around his neck, however, the injuries and loss of form that had plagued him appeared to matter little. These days, the name Maccarone is likely to elicit a rueful chuckle amongst Middlesbrough fans. In 2002, however, the Italian was one of the brightest talents in his homeland, one of the few players to be given his Azzurri debut whilst playing in Serie B. Just over £8 million had been enough to convince Empoli into letting him sign for a revitalised Middlesbrough, with new boss Steve McClaren eager to build a ginger dynasty. Juninho’s pressure might have eventually paid off, but it was an early indication that he would not be enjoying the same kind of treatment under McClaren as he did under Robson. Indeed, by that January Juninho’s third coming was already falling to pieces. Upon his arrival, he’d suffered a horrendous cruciate ligament injury that left him sidelined for six months. On his return, he struggled to break into a midfield performing well. Increasingly, his future looked uncertain. With his injury ravages behind him, Juninho looked to rid the memory of the previous campaign. Middlesbrough performed atrociously, however, sinking into the relegation places in the early fixtures. Finally, their form upticked in the New Year, with Juninho forming an understanding with Bolo Zenden and Gaizka Mendieta in midfield. The club recovered to finish 11th, and victories over Everton, Tottenham and Arsenal saw them face Bolton in the final of the 2003 League Cup. It was a chance to win the club’s first trophy in 128 years. A “botched beauty of a final” – that’s how The Guardian’s Kevin McCarra described the game at the Millenium Stadium, which saw McClaren’s men make history for their club. A scrappy first half gave way to a more enterprising second, with Juninho coming to the fore as Boro looked to lock down their lead. Moments before the final whistle blew, he was released by a pass from deep, twisting and turning as he bore down on the retreating Bruno N’Gotty. Only the Frenchman’s trailing leg prevented what thousands of red-shirted fans so desperately wanted. No matter, as the game finished seconds later. Juninho simply clapped towards the stands, nodding his head with the smile that had lit up Middlesbrough in each of his smouldering spells. Yes, he seemed to say, this really is happening. Once Gareth Southgate had lifted the trophy, he passed it back towards Juninho, but with typical humility he deigned to Mendieta, before holding it aloft jointly with his compatriot Doriva. It was, he later admitted, a feeling on par with winning the World Cup two years earlier. Middlesbrough had made it into European competition, but their progress in the UEFA Cup would be managed largely without their best player of the last decade. Juninho found himself on the fringes of McClaren’s team, and a move to Celtic in January finally put him out of his misery. Martin O’Neill has never been renowned for his attention to tactical detail. The Irishman is cautious by nature, so when Celtic’s interest in Juninho surfaced, it seemed an unlikely courtship. Suspicions appeared misplaced, though, when he was voted man of the match for his debut against Rangers in the Old Firm derby. He was speaking in his current role as Ituano president, a position he took in conjunction with his playing responsibilities in 2010. After helping O Galo avoid relegation on the last day of his first season, he watched them beat Santos four years later as they claimed their first ever São Paulo State Championship. The build of David, the heart of Goliath, and what increasingly seemed like the touch of Midas. Juninho, however, could spend a century at Ituano without enjoying the legacy he has in Middlesbrough. A man born one hemisphere and 6,000 miles from Yorkshire epitomised everything that makes his adopted city so great, from the fortitude of the Transporter Bridge to the beauty of the Museum of Modern Art. He may have left the club over a decade ago, but a part of him will remain on Teeside forever. “I still think about Middlesbrough and the times I had there all the time,” he admitted to Sky Sports last year. Ask any Boro fan and they’ll tell you the same.